Pre-heat the oven to 180°C2. 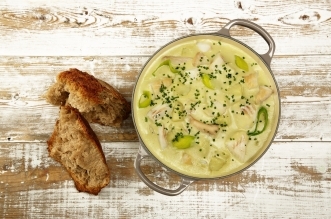 Heat a medium sized saucepan and throw in mussels, shallot, garlic, carrot, thyme and cider. Cover with a tight fitting lid and cook for 2-3 minutes until all of the mussel shells have opened. Drain in a colander, reserving the cooking liquor. Strain the liquor though a muslin cloth or a very fine sieve. Remove the mussels from their shells. Heat the sunflower oil in a non-stick frying pan; season the halibut with salt and pepper and cook gently flesh side down for about 3 minutes. Turn the fish carefully, add 1tbls butter and pop the pan into the pre-heated oven for 6-7 minutes, periodically spooning over some of the cooking butter. Meanwhile, in another saucepan, slowly soften the leeks with a tiny pinch of salt in ½tbls butter without colouring. Pour in the reserved mussel cooking liquor, bring to a boil and then simmer until reduced by half. 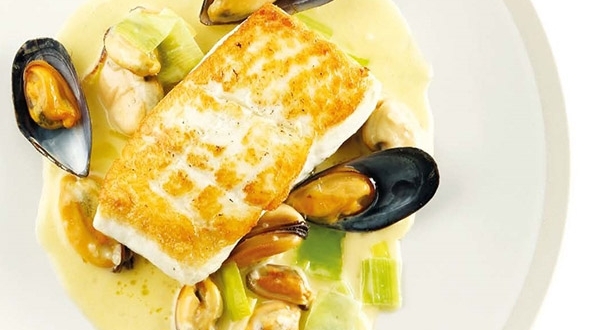 Add the double cream and swirl in the remaining ½tsp butter followed by the shelled mussels. 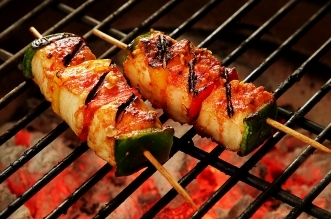 Enliven the sauce with a little squeeze of lemon juice and check seasoning – adjusting if necessary. 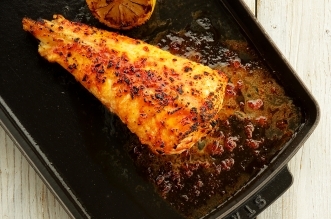 Remove the fish from the oven and finish with a squeeze of lemon. 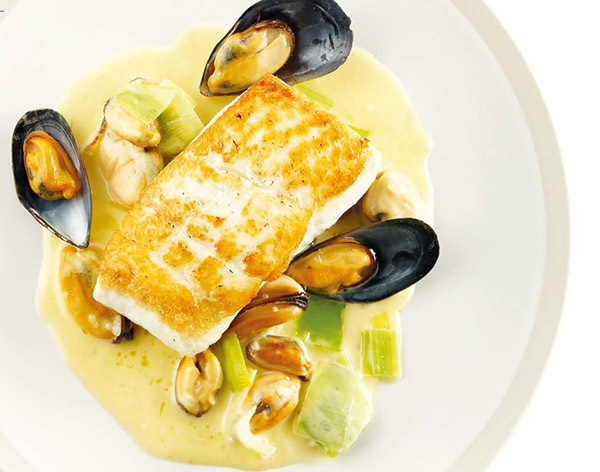 Place a halibut fillet into the centre of warm plates and spoon the mussels and their sauce around. Serve immediately with some boiled new potatoes and steamed green vegetables.